I’ve recently finished these silver earrings, inspired by the flowers of the poppy. We see a lot of poppies around here, growing in the wheat fields, meadows, gardens and verges. They’re big, bold, blousy flowers, and the red ones in particular make a real splash of colour. I’ve been thinking about designing some poppy earrings for a while now, but I think I needed them to appear in the landscape again to give me the final push! 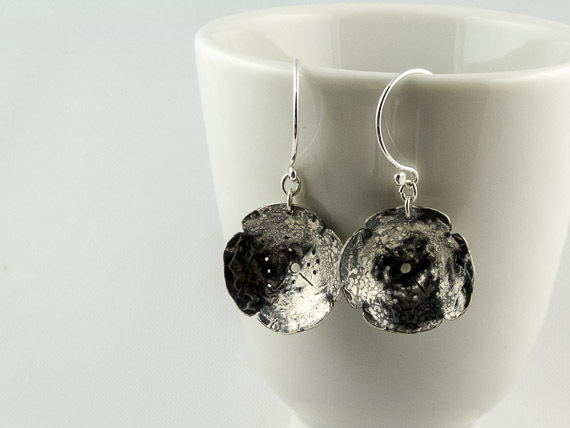 They are cut by hand from sheet silver, hammered, and they have an oxidised finish. This has worked really well, with swirls of pinky-grey colour which really emphasise the texture of the hammered surface. They’re perfect for hot summer days and long summer evenings. The poppy is one of the birth flowers for the month of August, so they’d be a perfect gift for anyone with an August birthday. You can see more pictures, and find more information, in my Etsy shop. I’ll keep an eye out for that! 🙂 You have a beautiful blog!